The Ankara Museum of Anatolian Civilisations is a real treasure trove of ancient artifacts. i could have spent days there. I really liked this lion sculpture and luckily it is covered in round curls. Not very fierce though is he? Becky’s been collecting lots of squares with circles this month, have you? I’m back in Turkey again today, with a photo from a village in Anatolia. I’ve ticked the boxes for Becky, with circles in my square. It’s been a while since this lovely old cart’s been anywhere. I hope it doesn’t completely fall apart. Just a week left now in March, you can still join in, Becky’s last Sunday March square is here! Ben Huberman calls for order in this weeks photo challenge, and he has a tempting array of pastries in his well ordered photo. The image below is one of my all time favourites and I may have posted it here before. This vast courtyard is part of the Ataturk Mausoleum complex in Ankara, the capital of Turkey. As well as the mausoleum which is the final resting place of Kemal Ataturk, the founder of modern Turkey’s final resting place, there is a museum dedicated to his life. For this theme you are invited to translate the tactile quality of the surface of an object into an image, and to make it black and white. I’ve chosen some texture from 2500 years ago, that’s getting more tactile as it ages. Paula is asking for images with traces of the past for her Thursday Special this week. This is the Odeion at Troy in north west Anatolia, Turkey, it dates back to the Roman Troy 1X and was renovated in 124 AD, by Hadrian. I wonder if that was before or after he built the wall in the north of England, what a busy man. 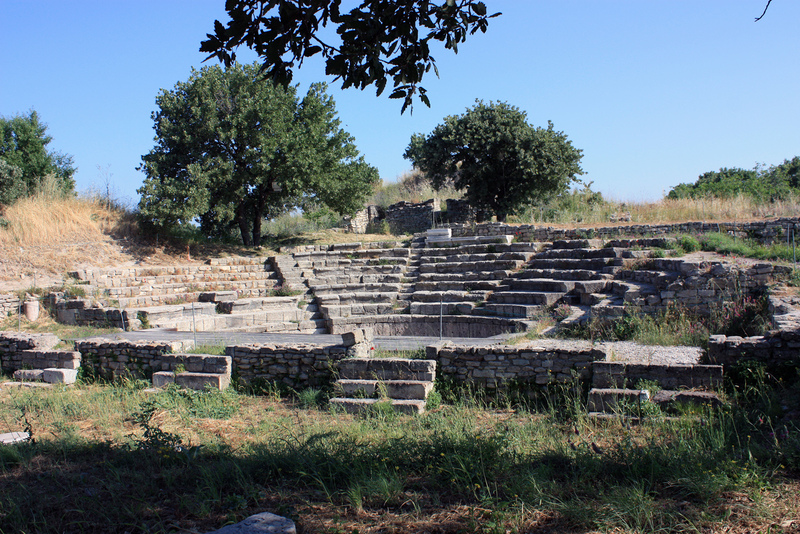 The Odeion has a semi-circular orchestra, surrounded by a wall of lime stone slabs, above which rise tiers of limestone seats, divided by aisles, into wedge shaped sections. Can you imagine the performances that took place there? I’m sure you can still hear the echoes on a hot, still day. . . Thanks Paula, I could do lots of posts for this theme.